Geology Lateral moraine. Erosion patch below thin peat. Record Name Barningham Low Moor. Barbed and tanged arrowpoint. Stray find. 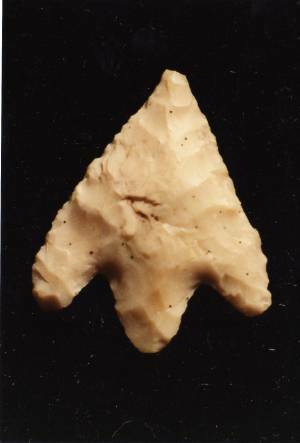 Record Description One of several later prehistoric arrowpoints found on Barningham Low Moor. Note that all lithic finds from Barningham Low Moor have been of Later Prehistoric character. No single find of Mesolithic character has yet been recorded from the Low Moor. Image 1 Description Sutton Type barbed and tanged arrowhead. Barningham Low Moor.